Tara and I have recently discovered hashtags. I know, I know. They’ve been around for a few years now. We’re late to the party because neither of us really utilizes Twitter, where hashtags were born. If you’re unfamiliar with what they are, allow me to enlighten you. They aren’t something you order with bacon and eggs. That would be hash browns. Simply put, hashtags are a word or phrase preceded by a hash or pound sign (#) and used to identify messages on a specific topic. They are a useful social media tool for finding like-minded individuals or posts. 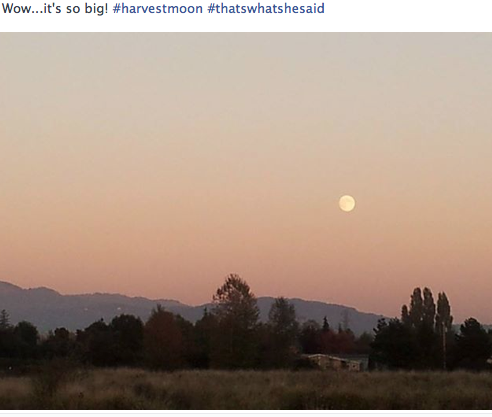 For example, on Instagram, I’ll often post a photo and use a #portland hashtag. This allows other people who have posted photos of Portland to find mine, and vice-versa. I’ve found people to follow this way. What can I say? #hashtagshelpmemakefriends. And, there was this picture she posted on Instagram. She is certainly not alone in her views. Jimmy Fallon recently did a sketch on his late-night show with Justin Timberlake poking fun at hashtags. It’s quite hilarious, actually. #watchthisandlaugh #jimmyfallonrules #jaywho?! It had been a while since we’d driven north to Seattle (I always say Seattle, by the way, when in reality Tracy lives in one of the eastern suburbs. We never even caught a glimpse of the Space Needle or downtown this trip. Sometimes we do, other times we don’t. It’s like how I tell people I’m “from Portland” when really I don’t even live in Oregon. #detailsdetails). Anyway, our last visit was way back in July. It feels even longer, with all that has taken place between then and now. We always leave right after work, and are on the road by 5:30 for what is normally a three-hour drive. Last time it was sunny and bright the whole way. This time, darkness had already fallen. The change of seasons can bring such a different feel to that drive. We got in a little after 8 and spent plenty of time visiting and catching up. 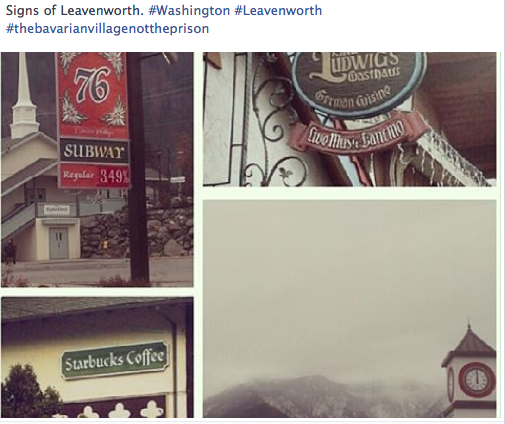 The highlight of our trip was the visit to Leavenworth on Saturday. Neither Tracy nor Anne had ever been, while Tara and I visited once before, last February. Fascinating history behind this town. It was a logging community that nearly became a ghost town when the railroad was relocated to Wenatchee in the 1920s. Struggling with a way to survive, a couple of logging residents who had visited the Danish town of Solvang in California decided that, hey – since Leavenworth is in the mountains and gets a lot of snow – why not turn it into a tourist attraction by transforming the whole city into a Bavarian-themed village? And the rest is history. It’s pretty quaint, and they’ve done a great job. Even the local gas stations and McDonald’s restaurant look like they were plucked straight out of Germany. We ran into quite a bit of snow crossing Stevens Pass, but Leavenworth itself was dry…and cold. Good thing we were all bundled up. We killed a few hours there, ate some German food for lunch, and got back home after sunset. Had a late dinner (fantastic homemade chicken and noodles), played cards, and drank late into the night. It was a very full (and fulfilling) day. Sunday, on our way out of town, we made a detour to Kirkland to meet up with our blogging friend Nancy and our other blogging friend (first time we met her), Taire. Nancy recently sold her townhouse and relocated to an apartment. She was somewhat leery of downsizing, but her place is amazing. It’s a top floor, corner unit with a view of Lake Washington. The bottom floor consists of shops and restaurants. Talk about a great little community. Hardly a step down, in my opinion! It’s very cozy and homey and makes me dread our own impending move somewhat less (though I doubt very much we’re going to end up someplace that has a lake view). We all went out to a sports pub for a late breakfast and Bloody Marys. Tara and I were the lone spots of orange in a vast ocean of Seahawks blue and green. Doesn’t matter, though. We wore it proudly. We had a nice, long-overdue visit before the 3-hour drive home. Here are a few more photos from our weekend. HILARIOUS post about hashtags, Mark! Also, I LOVED the video clip! And it’s funny you posted the because I have been seeing #’s all over the place and had no idea what they were used for. I mean I knew what they were called but didn’t know why everyone was suddenly using them – especially on Pinterest and Google + – but I’ve also seen bloggers using them in their posts. What a great set of photos from your weekend trip. That village looks like a totally different county – it’s so charming! And I’m loving the Bavarian Starbucks sign!!!! I can’t get into the hashtags, and if I see one more Bitstrip on FB, I’m going Postal! I saw that video clip awhile ago, and it is HILARIOUS! Your trip sounded just lovely! My kind of town. And my twin sister Tara has almost the same hat as me! Score. I agree with you on the sudden surge in Bitstrips on FB. Where did those come from all of a sudden?! Brilliant title for this post, Mark! It may be your best to date. It’s only recently that I’ve begun to appreciate hashtags. Though I wrote a post once about somebody calling their baby Hashtag. Sorry that’s just too much! Baby Hashtag? Yeah, that’s just ridiculous. On the way to Leavenworth we passed a town called Startup. I thought that was a bit odd! Hahaha…this one had me laughing…and yeah…some of #yourhashtagsmademelaugh, but you will still never convert me. I can see why you and Tara have fun doing the hashtags since you are both like to compete. I, however, will gladly stand in Heidi’s corner or she can stand in mine. T’was a great weekend and one I will enjoy remembering!! Glad you had so much fun! We did, too. Sure beats just sitting around, eh? My only regret is that I didn’t get my pretzel. Next time, for sure! I originally started on Twitter before blogging, but I’m too wordy for Twitter! Do you follow Pouring My Art Out? Some of his tweets are great! Nope, but again, I rarely ever Tweet. If I ever get into it, I’ll start following him based on your recommendation!